We decided to take a four day trip to Vietnam and cover primarily the Vietnam War related attractions in and around Ho Chi Minh City, and then visit a less modern area of central Vietnam. 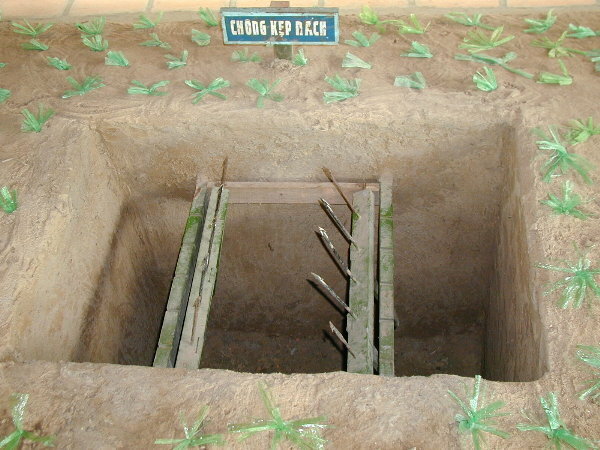 Our visit to the War Remnants Museum, the Cu Chi tunnels, and the location of the Son My (My Lai) massacre were quite sobering, especially as all information was provided from the Vietnamese (anti-American) viewpoint. Our way-too-short visit to the amazing China Beach in Danang made us want to stay there much longer. When we finally got through the Vietnam immigration control, met our local guide, and headed to our hotel for a brief rest, we immediately knew that Ho Chi Minh City was a fairly modern but different city. Ho Chi Minh City has all the major buildings and typical modern stores lining every downtown street, but with the big difference of very few cars. In place of each car is a thousand mopeds and a hundred bikes. Supposedly, there are 3 million mopeds in the city, with a population of 7 million in the city and surrounding areas. On most major roads we traveled in the city, one lane each way was reserved for mopeds and one for cars, but the mopeds would not fit in their own lane, so both were used by the mopeds. 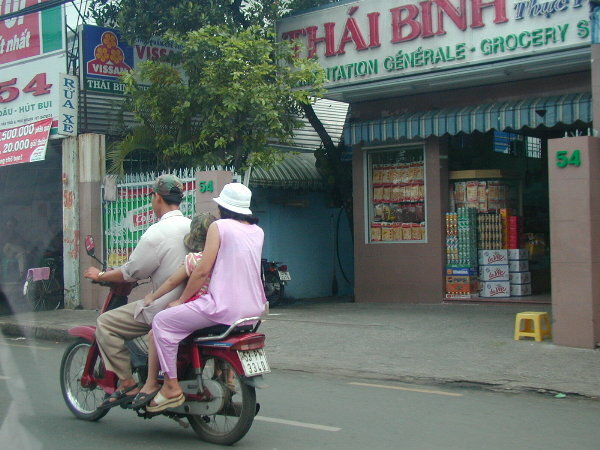 We often saw mopeds with a family of four people squeezed onto them. Interestingly, there are few stop lights and stop signs relative to the number of intersections. We noticed that people enter the intersection, typically after slightly slowing down, and then weave their way through the crowded intersection. Our guide admitted that their were many accidents, but most of them were minor because they involved mopeds traveling at slow speeds. Our Ho Chi Minh guide, Son, made it clear that his job was to please us, no matter what. Although that is typically good, it meant that he asked Dan every 10 minutes 'Mr. Dan, are you feeling well, now', and talked a tremendous amount. As in Cambodia, most of what he said we could not understand (see Cambodia Language Barrier). Since we had arrived very early in the morning, we went to the hotel to rest for a few minutes, and then walked around the corner to use an internet cafe to confirm our hotel for our return to Bangkok. As we had found in most of Asia, the internet cafes were extremely inexpensive -- less than US$1 equivalent per hour. Our first tourist site was the China Town area of Ho Chi Minh, where we visited the Bin Thay market. We were not that excited about seeing another market, worried that we would get harassed by vendors. However, this market was a wholesale market, and not a single vendor approached us. There were thousands of stalls, all grouped by category of product, a maze through which wandered. We then visited a pagoda in China Town, but given all the pagodas we had seen, we did not stay long. We visited the Vietnam War Remnants museum near the center of town. 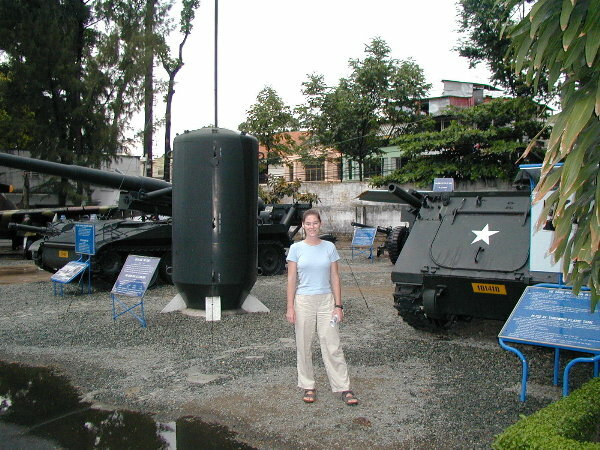 In the outside area of the museum, we viewed many large weapons leftover by America as we departed Saigon in 1973 including tanks, bulldozers, heavy artillery, large bombs, and aircraft. We then went into the five large rooms that held the major content of the museum. Our guide warned us multiple times that many Americans do not like to enter a couple of the rooms because of the graphic detail in the pictures and displays. Of course, we disregarded that since we had traveled so far to see the place. As we started walking through the first room, our very attentive guide stood within one foot of us, wanting to describe each picture, as we read the caption. After 10 minutes of this, Dan had to nicely ask him to let us experience the museum on our own! It was clear to us as we looked at the pictures and read the captions that this museum was put together by the victorious North Vietnamese anti-American regime, as you would expect. The pictures were quite graphic and disturbing, but we had seen many of them before in magazines, books, and movies. However, the descriptions of the pictures were very one sided, with references to GI's or Americans as 'aggressors' or 'murderers'. For example, there was a terrible picture of a GI in a field carrying the upper torso and head of victim of a large explosion, and the caption said something like 'the murderer GI is laughing as he carries the remains of an innocent victim'. Looking closely at the picture, the GI is clearly not laughing. No one can argue that the Vietnam War was terrible, but seeing this generally one-sided view was also very disturbing. In the napalm section of the museum, they had deformed fetuses in glass jars as examples of the lasting impact of napalm. 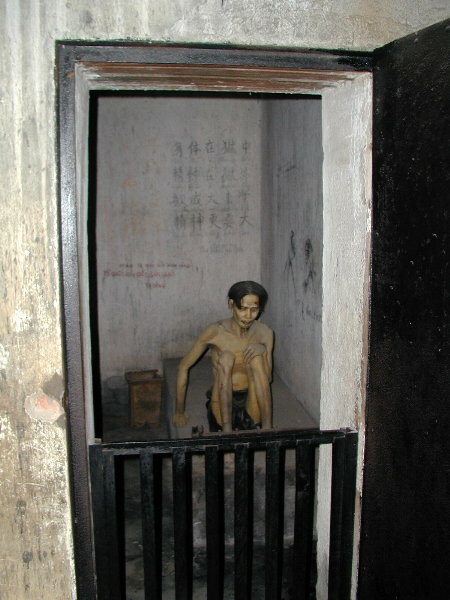 In the prisoner portion of the museum there was a life size 'tiger cage' where the South Vietnamese kept prisoners between torture sessions. To be fair, every item was not as one-sided as others, but in general that was our impression. 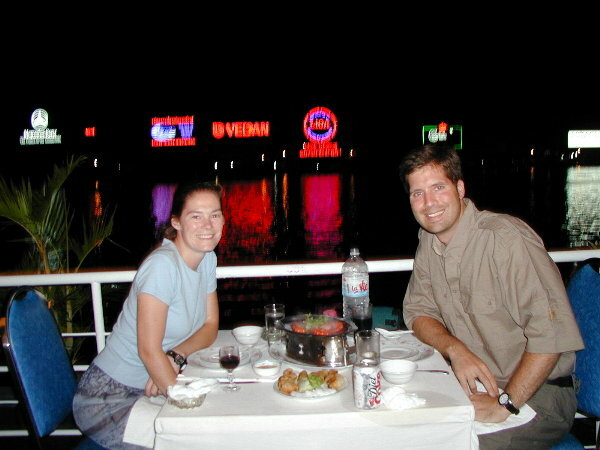 That first, night we did not realize that our package included the obligatory river obligatory river boat dinner cruise on Saigon river. Fortunately the cruise was not crowded and only lasted only about an hour. Even though the food was terrible, it was nice to see a different part of the city and to see the river. 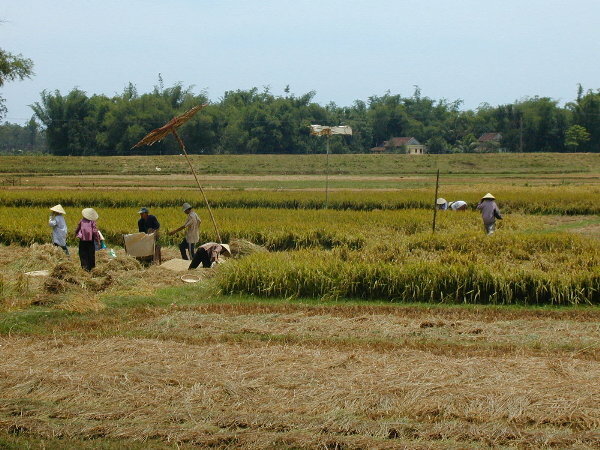 The next day we drove through the rice farming areas outside of Ho Chi Minh City on our way to Cu Chi. We witnessed the manual rice harvesting in several fields, and visited a shop where a woman was expertly manually mass producing rice paper. 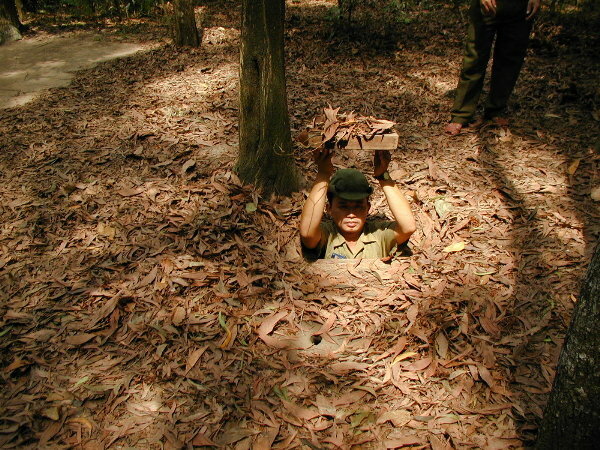 The main reason people visit Cu Chi is to see the network of tunnels dug and used by the Viet Cong during the Vietnam War. On arriving at the welcome center, we watched a very old scratchy documentary (circa 1970) about the tunnels and how they were used. 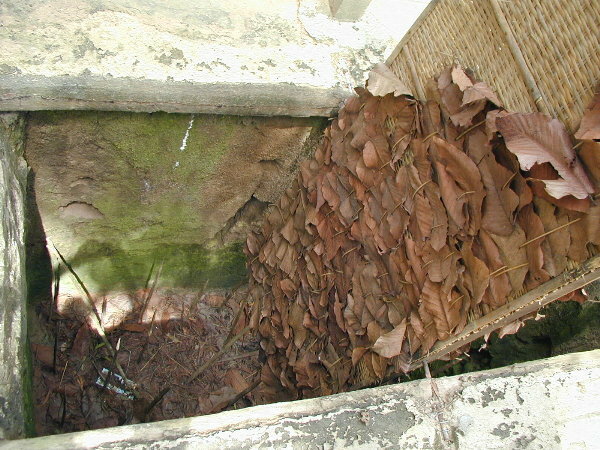 The Viet Cong dug over 250km of tunnels in the area, mostly to evade American/South Vietnamese forces as they moved between locations, and to serve as an ambush vehicle against enemy forces in the area. 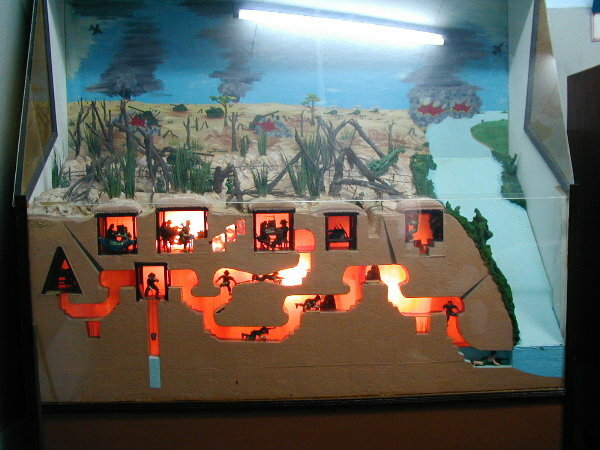 The tunnel network was incredibly advanced, as we could see from the model in the front of the movie room (see picture at right). The tunnels were three levels deep (8-30 feet below the ground), and had all kinds of features to fight the enemy. They had trap doors and booby traps in case the enemy entered the tunnels. Entrances to the tunnels and portions of the tunnels were extremely small, purposefully too small for the typical American male. They had ways to cut off sections of the tunnel to trap chemicals or water poured into the tunnel. They had many hidden entrance/exits so that they could surprise the enemy, or disappear after an attack. They also had whole rooms underground, for sleeping, meetings, medical care, and cooking. The venting system for the kitchens were set up so that the smoke seeped out of hidden leaf piles far from the tunnels -- they had a sample kitchen working and it was almost impossible to see the smoke. And the network had emergency escape routes on the lowest level hidden under the river. Because of the high-Viet Cong concentration around Cu Chi area, it was the site of some of the heaviest American bombing in South Vietnam. The pro-Viet Cong movie explained many of these features, and also had live footage of the Viet Cong surprise attacking enemy troops. 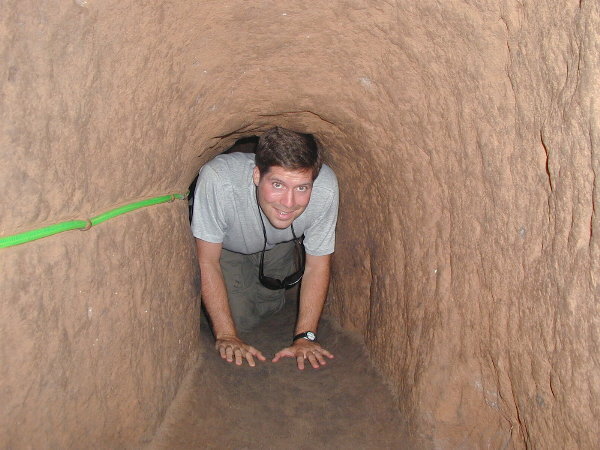 It also showed the many villagers who used the tunnels with the Viet Cong. They had a woman villager who received medals for her role in killing so many enemy troops. The real life footage made it clear to us how difficult it was to tell the difference between the Viet Cong and civilian villagers. Some sections of the tunnel network are available for tourists to enter. The first tunnel we entered had been enlarged almost a foot to enable tourists to more comfortably get through it. Even with the enlarged size, it was quite claustrophobic as we duck-walked through the dark, damp, very hot, mosquito-filled tunnel. They offered to let us out via escape routes along the way, but we went the entire length (300 feet), down through all three levels. It was hard to imagine being in the tunnels for weeks on end while bombs were being dropped above. We chose to enter another section that had not been enlarged, so that we could see what it was really like during the war. We had to actually crawl through some of the second tunnel up and down the different levels. After the available 150 feet, we were happy to get back above ground, as we were completely soaked with sweat and dirty. As we walked through the woods around Cu Chi, on our way to the tunnel entrances, we realized that they were trying to help us realize what it was like during the war. They had booby traps set up so that when your foot broke a string across a path, there would be a large bang next to the path, simulating an explosion, showing how hard it was to avoid the traps. Because there was another couple just ahead of us, they hit all the traps, and we just saw it all second hand. Even so, the effect was real -- the idea of being in the thick woods, with Viet Cong popping up out of perfectly hidden tunnel exits, and booby traps around every corner, was very scary. They had several real life examples of the pits they dug in the area to injure and kill the American troops. 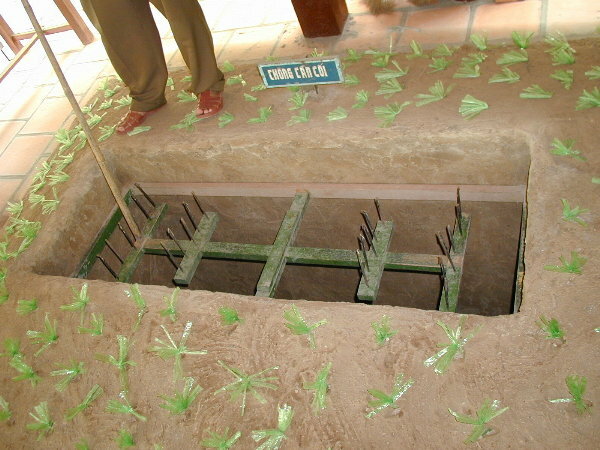 Each hole had some sort of spiked arrangement of metal or bamboo, to impale the person who had happened upon the pit. Some of them were barbed so that the victim could not get the contraption off his legs, and he would have to be taken to the medical area with the contraption, slowing him down and making vulnerable the assisting troops. They offered an M16 shooting range, but given our sour mood at that point, and since we had already shot large weapons in Cambodia (see Cambodia-Shooting), we passed on it. A panoramic view of the crowded streets outside Binh Tay market in the China Town area of Ho Chi Minh City. There are 3 million mopeds in Ho Chi Minh City. 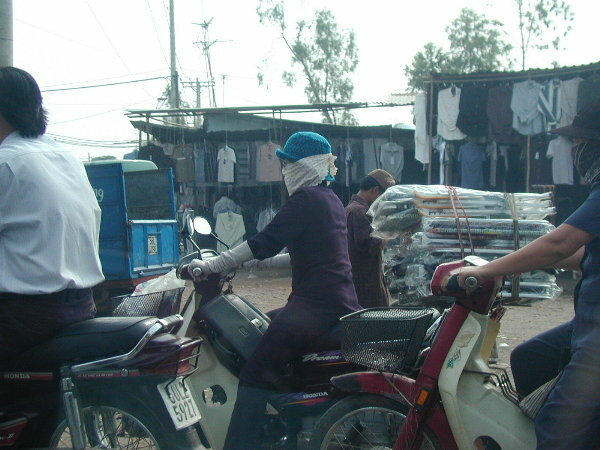 Most women riders cover their skin to avoid the sun and cover their mouth/nose to protect against the pollution. The moped serves as the family vehicle -- we saw many cases of a family of four on a moped. We visited the War Remnants Museum. Outside they had weapons/vehicles left by the Americans as they left Saigon/Ho Chi Minh City. We did not take any pictures inside the five large rooms of the War Remnants Museum, mostly because many were incredibly gruesome and we felt that it would be disrespectful. 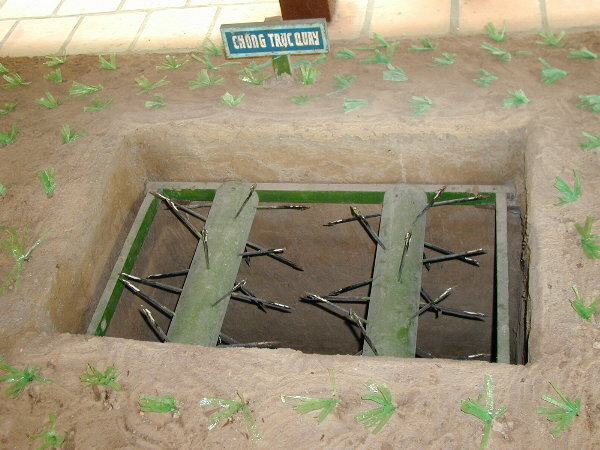 This is a recreation of the 'Tiger Cells' where the South Vietnamese (and Americans) kept their prisoners. The museum definitely represented the Vietnamese view of the war of American aggression. 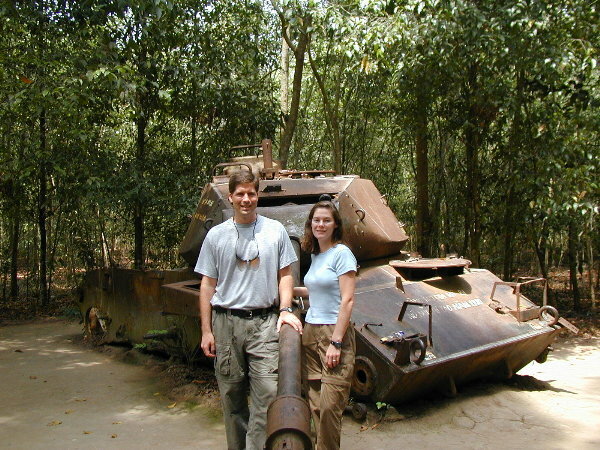 We are in the woods at Cu Chi, outside Ho Chi Minh City, where extensive fighting took place in South Vietnam. We walked through the woods to view where fighting took place, and to experience the Viet Cong tunnels. We experienced the tunnels first hand. 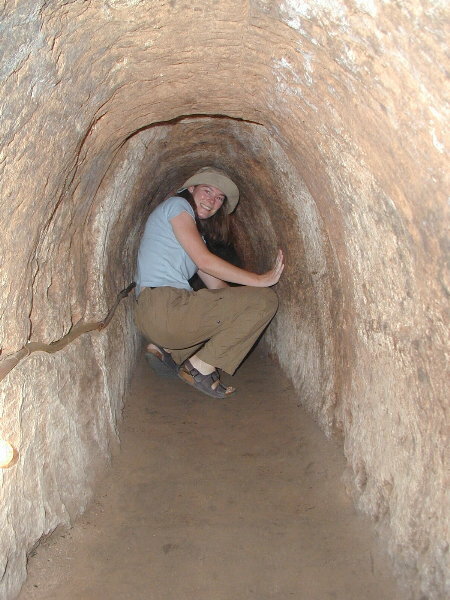 In this set of tunnels, we 'crawled' 100m from one entry point to another. 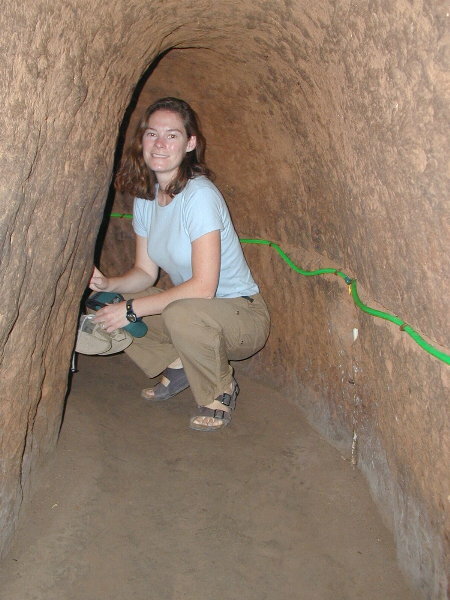 Note that this particular section of tunnel had been dugout about 18 extra inches to make it more tourist-friendly. 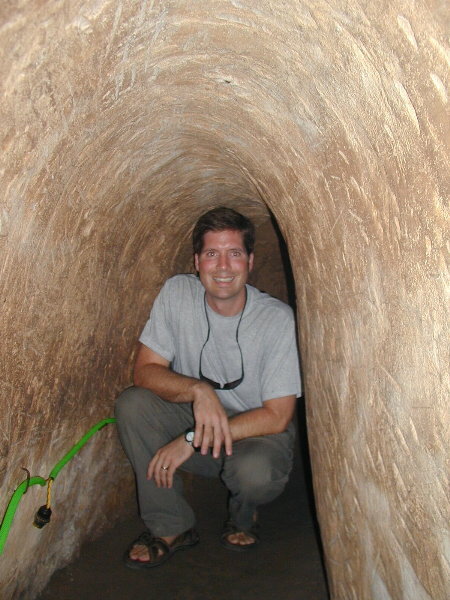 Although the tunnels were dugout to be more tourist-friendly, walking the length of a football field, traveling down over 30 feet underground, with tons of mosquitoes, was mentally and physically challenging. We can't imagine doing it with bombs and bullets exploding overhead. This 50m span of tunnels had not been dug out, so we got the real experience of how tiny they were. The flash of the camera made the tunnels seem lit up, but they were quite dark and damp, with a very small amount of light provided by tiny lights sparsely placed on the pipe on the right wall of the tunnel. The real entrances to the tunnels were well hidden and kept very small, too small for the typical American soldier to enter. Imagine walking as a soldier through these woods, and having an enemy soldier pop out of this hole with a gun. We saw many examples of the booby-traps placed all through the woods to wound/kill the American soldiers. Hearing the details and purpose of their specific design was depressing. Quite sobering to think about facing an enemy who could expertly disappear and re-appear anywhere using the tunnels, and at any point you could fall into these booby traps. We traveled to Danang in central Vietnam, to get a feel of the non-big-city Vietnam. This panoramic shows the river that flows through Danang. While driving through the countryside in central Vietnam, we saw many rice fields, some of which were being harvested (which happens 3 times a year). We visited the sight of the most famous 'civilian massacre', Son My (know in America as My Lai), 120km from Danang. This is where American soldiers killed 504 women and children in 1968. At Son My, they had graves where many of the families lived and were killed. This plaque sits beside the ditch into which 170 people were pushed and then shot. 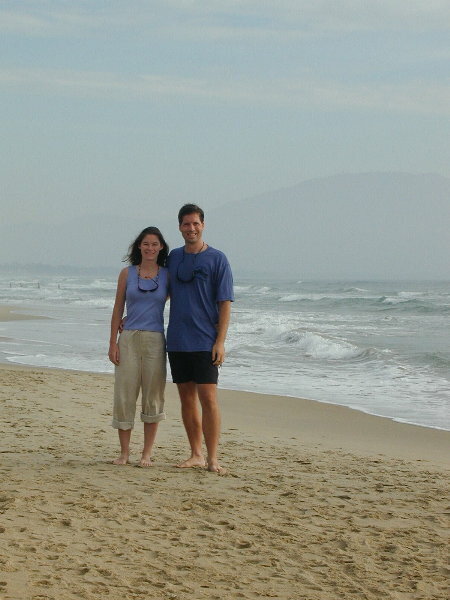 After all the sobering Vietnam War touring, we stayed at China Beach in Danang. China Beach is absolutely beautiful -- if only we had done this part outside a packge, we would have stayed here a week! The resort where we stayed is one of the nicest we have visited. This perfect swimming pool provided a great view of the beach. The only resort we saw on the entire beach was the one at which we were staying. This is truly an unspoiled beach. At the end of the day, parts of the beach turned from deserted to a haven for the local families to play. Thousands of children played in the sand and ocean, or played in one of the many beach soccer games. Even though the sun set over the mainland, hidden by the trees, the sunset time was beautiful on China Beach. Notice that even during the peak local crowd time, much of the beach was still deserted. 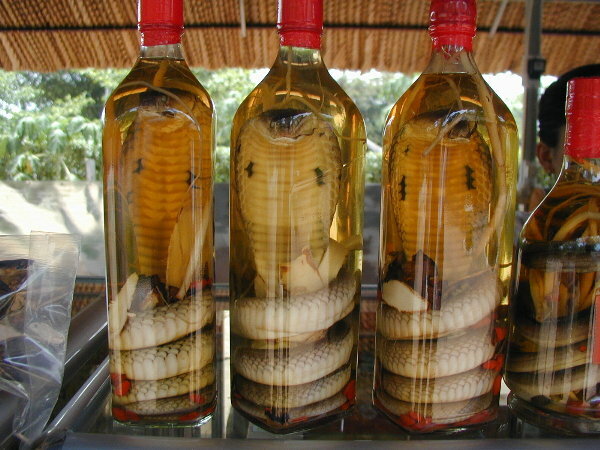 A delicacy in Vietnam is snake wine. Many places offered it, along with a description of the many afflictions it supposedly cures. As much as we wanted to get a bottle (just for show), we figured there was no way we could get it through US customs. Very early the next morning, we flew to Danang in central Vietnam. 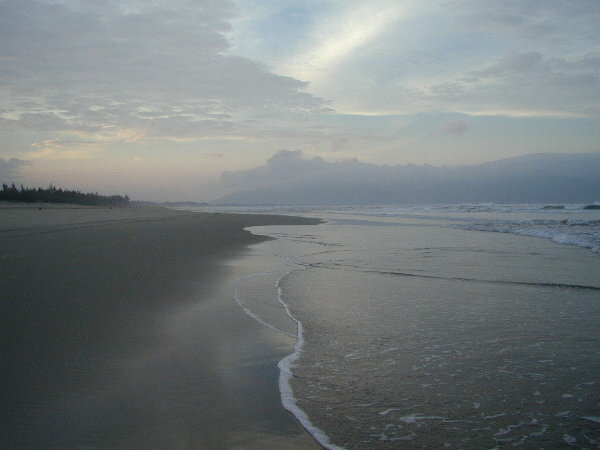 Danang is a much smaller town than Ho Chi Minh City, but still one of the major cities in Vietnam. We had originally wanted to visit the war-time Demilitarized Zone (DMZ) in central Vietnam, but no one seemed to know where it was or how to visit the area -- actually, some of that was language barrier. 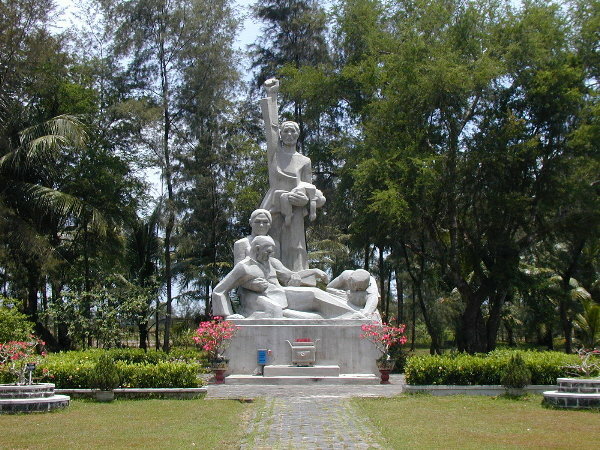 Instead, we decide to visit the site of the Son My massacre, 120 kilometers from Danang. Our local guide picked us up from the airport and we drove 2½ hours to Son My along the main highway running through central Vietnam. The 1½ lane road was extremely slow because two cars could barely fit going opposite directions, and there was no point when there were not tons of mopeds or bikes, causing us to crawl the majority of the way. When we arrived at the site of the massacre, we watched a video that had several first hand accounts of the massacre, much from the American viewpoint. In March 1968, American troops ordered bombing on Son My, then entered the village and killed 504 people, most of whom were women and children. The event was one of the most publicized tragedies in the war. One of the main people in the video was the American helicopter pilot who saw what was going on and tried to stop it, and actually saved the only survivors of the village. The grounds of the site had tombstones for the families that had been killed in the area, listing the names and ages of each family member. 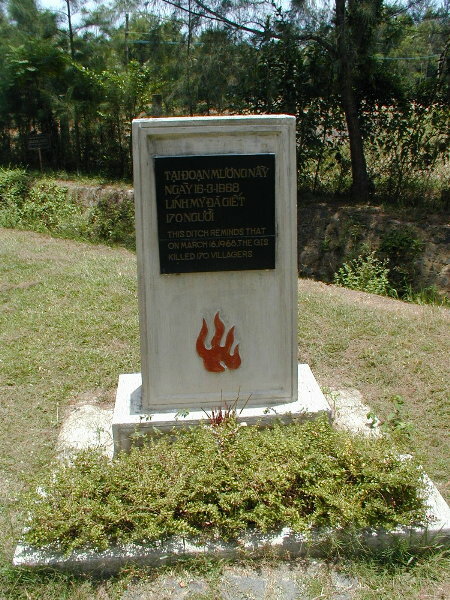 They also had a commemorative plaque at the site of the ditch into which 170 villagers were pushed and shot. On the way back from the village, our guide tried to engage us in detailed conversation, but once again, even with lots of effort we could not understand half of what he was saying (see Cambodia-Language Barrier). In Danang we stayed on China Beach, the spot where American troops went for 'R&R' during the war, and the subject of the short-lived TV show 'China Beach'. We arrived at our hotel, the Furama Resort, in the late afternoon, and immediately realized we were in a great place. The Furama is a five start hotel with all the restaurants, lagoons, pools we would expect, but on one the most beautiful beaches we have seen. The hotel had several open air and enclosed restaurants, a huge pool and snooker room, a modern health club, a media room with a 75 inch TV and hundreds of movies to choose from, and two movie channels that continuously ran newer American movies. We tried to skip our arranged dinner in town and stay in the hotel, but it was too hard to negotiate that with our guide. We stepped out of our room onto the beach near sunset, and walked for almost an hour. At first, the beach was completely empty, but in minutes, it was packed with local families, hanging out, playing in the water, or participating in beach soccer games. Very unlike Juhu Beach in Bombay, India, this beach was clean and trash-free. Many of the children waved at us, said 'hello', and then broke out in wild happy laughter when we responded. We did not see a single other hotel on the entire length of beach except for the one in which we were staying. It was like a remote beach, but near a major town. Across one side of the horizon we could see the mountains that made up part of the bay. The water was clear and a perfect temperature, not too warm or too cold. Our next day in Danang was a 'free day', where we did not have anything specific arranged. We had thought about going to Hoi An, a popular 'old style' city 15 minutes from Danang, but instead we decided to enjoy the resort. We checked out novels from the hotel library and and sat by the beach side pool, reading and relaxing. We had an outstanding day, and so much wished we could stay there for a week. We wrestled with the idea of trying to stay longer, but we knew that it would be very difficult to communicate to our guide, the hotel, and our travel agent. We highly recommend China Beach and the Furama Resort! On our way back from Danang to Ho Chi Minh, returning to Bangkok, we had the feared technology failure we had hoped to avoid, but knew was inevitable. On the flight leaving Danang, Dan worked on the laptop, and then shut it down to land in Pleiku, a tiny town north of Ho Chi Minh City. When we took off again, he went to turn it on, and nothing happened. Since there had been no jarring of the laptop, and we had not passed through any additional xray machines, we hoped it was just a battery problem, but knew it was something worse. Dan had backed it up on departure to Cambodia, but if we could not retain the hard drive, we would miss all the pictures from Cambodia and Vietnam, and the thousands of words they represented! See Thailand--Laptop Repair for completion of this story. We few from Phnon Penh, Cambodia as part of our Vietnam/Cambodia package deal, so please see Cambodia -- Getting There for details. Nice five star hotel conveniently located near the center of town. 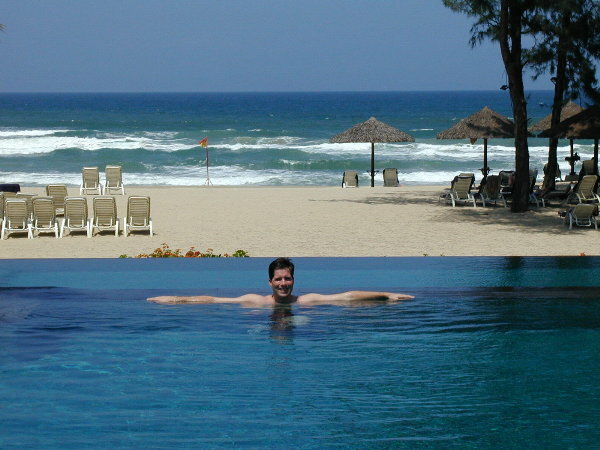 Furama Resort Website Outstanding five star resort on beautiful China Beach. China Beach is awesome and the resort is the best! Wish we could have stayed longer. Asia Discovery travel site Very good discounter for hotels and trips. Ms. Lek helped set up our Cambodia, Vietnam, and Northern Thailand trips. Found some other slightly cheaper hotel sources, but none we could meet face2face.